Our latest reviews: 06/02/12 | What Car? Read all of our latest car reviews here on whatcar.com. From all-new cars to the smallest tweak to an existing model, our road test team will evaluate and report. This is where you can find all the whatcar.com test drives we've published over the past week. You'll also be able to read all of our new nine-point reviews, too, along with any that have received major updates. Make this your one-stop guide to the latest model news. The Giulietta is available with a new TCT twin-clutch semi-automatic gearbox. The Hybrid 5 is based on the 5 Series saloon, and is the first BMW hybrid in right-hand-drive form. We take a test drive in Merc's new B-Class - a premium-priced rival to the Ford Focus and VW Golf. The SLK 250 CDI shrugs off its comfortable tourer role to offer a credible rival for Audi's TT TDI. 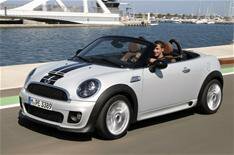 Find out what we think of the Mini Roadster - a new soft-top version of the new Mini Coupe. The Skoda Fabia 1.4 MPI SE is a new special-edition version of Skodas popular supermini. We drive prototypes of a Golf plug-in hybrid and the all-electric Golf Blue e-motion. We test the VW Polo ACT, which uses shut-off technology to help improve economy and cut CO2. A very respectable supermini, but can it trouble the best cars in this ultra-competitive class? Read all about it here. The Vauxhall Zafira Tourer is a decent MPV, but is it as practical, refined and easy to live with as its best rivals? Our most-searched reviews Use the dropdown menu, below, to view our most popular reviews in each category.